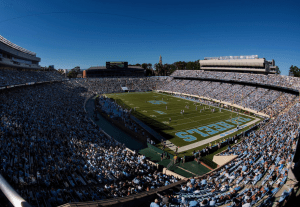 Kenan Stadium’s current capacity is around 63,000 fans (Jon Gardiner/UNC-Chapel Hill). Kenan Memorial Stadium, home of UNC football, has begun renovations to remove the silver bleachers and to replace them with Carolina blue, single-person seats throughout the stadium except in the student section. This renovation will lower the capacity of the stadium from 63,000 to 51,000, while improving the overall experience for fans.